Metagenics Probiotics – The Only Probiotic Supplements Canada Needs? By now you’ve heard how important it is to increase your intake of probiotics. But like many, you’re unsure about what exactly probiotics are and what they do. By definition, probiotics are bacteria that assist in maintaining the natural balance of organisms (microflora) in your intestines. This is no easy feat, given that the typical human digestive tract contains approximately 400 classifications of probiotic bacteria, all of which serve to mitigate the growth of harmful bacteria while promoting an overall healthy digestive system. While there are decades of studies praising the benefits of probiotics as a means to treat ailments in the stomach and intestines, current data asserts that they promote numerous facets of health. Recent studies from Harvard Medical School state that probiotics are effective in treating and/or preventing conditions such as ulcerative colitis, Crohn’s disease, vaginal infections, urinary tract infections, bladder cancer recurrence, and even eczema in children. The list goes on and on. The largest category of probiotics in the intestine is lactic acid bacteria, and the most common dietary source of this is found in yogurt with live cultures. However, only certain classifications of bacteria or yeast (referred to as strains) have been proven to be effective in the digestive tract. Given the challenge in delivering essential probiotics via diet alone, natural health supplements (NHP) have become crucial in filling the gap. And one NHP manufacturer has been more instrumental than any other in this capacity – Metagenics. 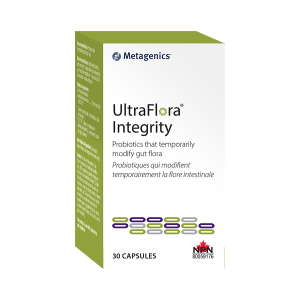 As a premier supplier of Metagenics supplements in Canada, InnerGood is providing a succinct guide on Metagenics UltraFlora non-GMO products that can deliver your entire household with everything required to fulfill its probiotic needs. This new addition to the UltraFlora line lives up to its name given that it has been targeted to improve the integrity of your intestinal immune health, with preclinical studies suggesting that it may influence tight junctions between intestinal cells and beneficially influence immune cell signaling processes. Better yet, you no longer have to gulp down pails of yogurt with live cultures to access the lactobacillus salivarius probiotic you need, as this product features a patented 100 million CFU of the strain. View more on UltraFlora Integrity. With a proprietary blend of seven key strains, UltraFlora Spectrum delivers multifaceted daily probiotic support for your upper and lower gastrointestinal tract for optimal health for your digestive and immune system. View more on UltraFlora Spectrum. This product is great for lactose intolerant (or sensitive) individuals in search of a probiotic solution, thanks to its dairy-free blend of important stains strains that include L. acidophilus NCFM® and B. lactis Bi-07®, both of which are beneficial bacteria that have displayed a capacity to support immune health and a thriving intestinal environment. View more on UltraFlora Balance. This is one example where which probiotics go above and beyond GI tract health to support your overall wellness, especially during cold season! Loaded with the proprietary Lactobacillus paracasei 8700:2 and Lactobacillus plantarum HEAL9, this product has been manufactured to mitigate the number and/or severity of symptoms typically associated with the common cold. View more on UltraFlora Cold Support. Yet again we see how UltraFlora digs deep into the science of probiotics to provide support to other dimensions of human health, with women being the beneficiary of this unique 50/50 blend of probiotics (Iactobacillus rhamnosus GR-1 and Lactobacillus reuteri RC-14). Easy to consume, this supplement is taken orally to help maintain the health of vaginal microflora while supporting urogenital health. 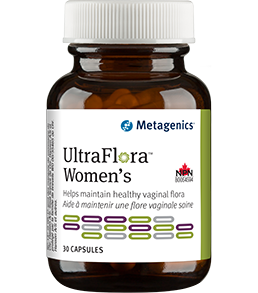 View more on UltraFlora Women’s. Do you experience loose stool on occasion? This supplement combines four separate strains of live bacteria to support healthy intestinal microbial stability and restore the firm consistency of your stool. View more on UltraFlora Restore. If you’re experiencing occasional gastrointestinal tract discomfort this may be the product for you. Tapping into the benefits of the lactobacillus plantarum 299v strain, this supplement has been designed to assist in the relief of occasional bowel irritation and discomfort, while promoting gastrointestinal barrier integrity and supporting overall immune health. View more on UltraFlora Intensive Care. Are you battling with occasional abdominal discomfort, bloating, cramping, and urgency that has you running to find the nearest bathroom? This advanced formula has been designed to help address gastrointestinal distress symptoms, alleviating concerns that can creep up at the most inconvenient times. View more on UltraFlora IB. This product is a great one for frequent travelers or anyone that absolutely needs to remove the concern of acute bowel distress (loose stools included) that can pop up at an inopportune moment. This supplement contains a special blend of beneficial bacteria and Saccharomyces boulardii to support your immune health. View more on UltraFlora Acute Care. Did you know that your kids can greatly benefit from probiotics too? This special supplement provides probiotics that may temporarily modify gut flora. In addition, the product has been developed to help reduce the symptoms (and duration) of the common cold that your children likely experience, including cold-related fever, rhinorrhea (stuffy nose, essentially) and coughing. And don’t worry about getting your kids to take this supplement, as the natural grape flavor makes this chewable treat something they’ll look forward to. 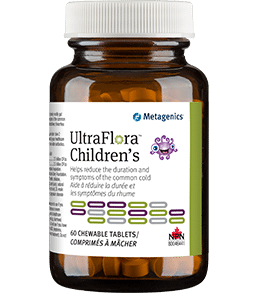 View more on UltraFlora Children’s. For those of you with babies and very young children, there’s UltraFlora Baby, a product backed by numerous safety and efficacy testing to deliver a probiotic that will help support the health of your little one’s intestinal environment. Backed by significant research and the fact that it has been manufactured to include an important bacterial strain called Bifidobacterium lactic (also referred to as B. lactis) this product has shown to be so effective as a complement to weight management plans that demand called for us to dedicate an entire article on the matter. View the detailed feature on why you should use UltraFlora Control for weight management. Caution: Do not use the above products if you have an immune-compromised condition (i.e. AIDS, lymphoma, patients undergoing long-term corticosteroid treatment). If pregnant or breastfeeding, consult with your doctor. Consult your healthcare practitioner prior to use if you have fever, vomiting, bloody diarrhea or severe abdominal pain. In addition, discontinue use and consult a healthcare practitioner if symptoms of digestive upset (i.e. diarrhea) occur, worsen, or persist beyond 3 days. Do not use if perma-seal is missing. Disclaimer: Do not use this product without consulting with your physician.